Matching gifts don’t sing or dance or pay for themselves to be plastered on enormous billboards. The work of promoting corporate giving falls on charities and nonprofit organizations, who always seek more effective marketing strategies than singing, dancing, or highway signs! Some nonprofits don’t capitalize on matching gifts because donors don’t know that corporate giving programs exist or that their companies offer such a program. With an estimated $6-$10 billion dollars worth of matching gift funds going unclaimed each year, nonprofits have many reasons to think creatively about how to promote matching gifts. Marketing matching gifts doesn’t have to be hard, or expensive, as evidenced by a recent study revealing that nonprofits at the top of peer-to-peer fundraising were also successful with corporate giving programs. Sometimes the best marketing is simply talking to a person about matching gifts - but you can’t talk to everyone in person, so here are a few easy strategies to reach donors and encourage them to think about matching gifts! Just like dogs have doghouses, matching gifts need a special place that’s just for them. A dedicated matching gift page is that place, and it’s where you can educate donors about matching gifts, as well as where donors can go to access all the information they need to submit a gift request. 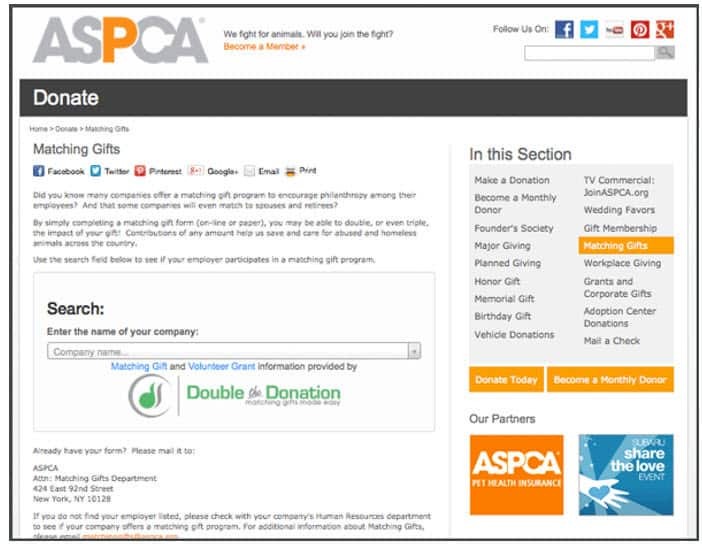 In addition to stating how matching gifts help the ASPCA, the page has a matching gift widget from Double the Donation that donors can use both to efficiently find out if their companies offer matching gifts and to access the relevant submission guidelines and portals. For nonprofits with a few hundred dollars to invest in their matching gift efforts, the search box is a helpful tool that takes much of the hassle out of creating a matching gift page, but, for organizations on a tight budget, there are ways around this expense. If you don’t have a search widget then you’ll want to either list out companies who offer matching gifts or provide general information on how donors can find out both if their companies have corporate giving programs and how to submit gift requests. The page should make it as easy as possible for matching gifts to be submitted, and, while that’s best accomplished with a search box, as a smart nonprofit, you can employ some extra effort and create a comparable result. A call to action for matching gifts with a [link to your dedicated matching gift page]. Did you know that many companies will double, triple, and even quadruple employee donations to nonprofits? 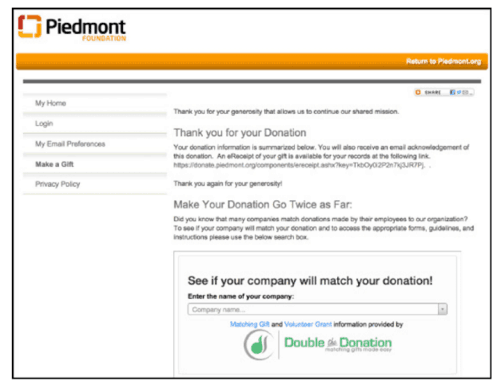 Find out if your company will double your donation: [insert link to your dedicated matching gift page]. Matching gifts help [name of organization] to provide additional services and events to further our mission. Please check if your company offers a corporate giving program: [insert link to your dedicated matching gift page]. Make your donation go twice as far by submitting a matching gift request today: [insert link to your dedicated matching gift page]. Adding matching gifts to your email signature should take five minutes or less, and you’ll be effortlessly promoting matching gifts with every message you send. A second email strategy is to incorporate matching gift appeals into your acknowledgement letters. Your nonprofit sends a thank you note to every donor, and this is a great place to request matching gifts. Donors are feeling the goodwill of their donations, and if you show them how easy it is to double their donations at no added cost to them then they’ll be more inclined to appease your request. At its heart, this is an acknowledgement letter, but it seizes the opportunity to play to the goodwill of the donor and requests a matching gift. There are two places to click, the blue link and the graphic, to access more matching gift information, which makes it easy for donors to follow the call to action. In addition to calling donors to action, don’t be afraid to pitch matching gifts in emails to non-donors. Fundraising appeal response rates increase by 71% when matching gifts are mentioned and the average donation made increases by 51%, and that is before the receipt of any matching gift funds. Acquiring new donors could be as easy as letting them know that their donations can go farther than they thought. If you’re a larger nonprofit already performing prospect research, make sure you’re incorporating knowledge of matching gifts into the evaluation of prospects and ultimately donation appeals. If you know which of your donors or prospective donors work for matching gift companies, then you can use that knowledge to increase the ask and ultimately the funds raised. 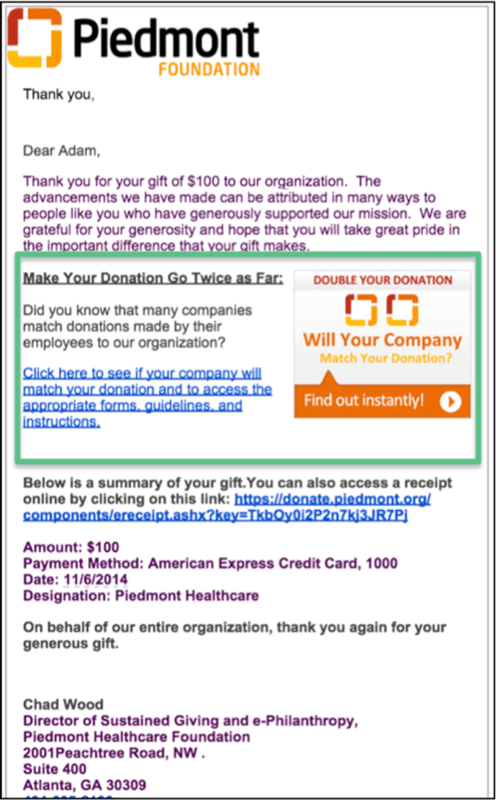 If you want to do one better than acknowledgement letters then promote matching gifts on your donation confirmation screen. Donors have literally just given and should feel inclined to give more at such a minimal expense of additional time. As on the dedicated matching gift page, this confirmation screen has a search box, but that’s not a necessity. What you need is the text above the box, an ask for matching gifts, and a link that directs donors to a dedicated matching gift page or other relevant information. The search box will make it easy for donors to find out if their companies offer corporate giving, but the idea is to encourage gift submissions, which can be accomplished with text and possibly a graphic, if you would be so inclined. While companies might struggle to evaluate the value of workplace giving programs, nonprofits have a surplus of ways to ask donors to help them to receive matching gift funds that so clearly do a world of good. If you’d like to learn more then join Double the Donation President Adam Weinger on May 20, 2015 from 1:00-2:00 pm EST for a webinar on matching gifts. You’ll learn the ins and outs of how marketing corporate giving works, and Adam will arm you with the knowledge to promote matching gifts like never before.